Hello to everyone from Sara Luce. Today, speaking about Angelic Numbers or Number of Angels I decided to give you a little additional help to listen to the messages that the Angels can give you during the many moments in your lives. We will talk about how the Angels can send us specific messages through numbers. We took as a reference point the translation from a book from Doreen Virtue for understand the meaning of Angelic Number. I was just waiting for a nice testimonial to touch upon this subject and here comes Roberta’s testimonial. Please read her testimonial first, and then we will continue with our topic of Angels and Numbers and Angelic Numbers. Hello Sara Luce, I would like to tell you what happened to me yesterday. I am a strong person and I always try not to show it when something worries me … this is not always a good idea, I know that, however I always get the feeling that I am misunderstood. And so, yesterday I was very nervous … I started to write everything that was worrying me, and I asked for help with facing all of it …. In the afternoon I went out with my girlfriends for a walk, I have to say that I did not really feel like going out that day …. 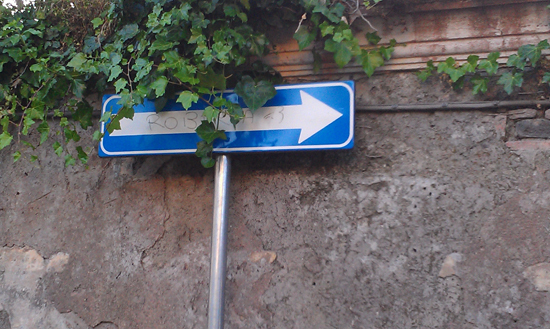 It was only when I returned home that my gaze rested on the enormous statue of an Angel that I have next to my bed, and there, in a flash, I saw the image of that street sign ... and that is when I connected the events. And now this is Sara Luce back again, I will let you see what I wrote to Roberta: Roberta = the number 3 made me curious, and so I went to see what the number 3 means, as per Doreen Virtue. The Number 3 means the ascended masters are helping you – usually it means it is an ascended Master to whom you are particularly close to, such as Jesus, Quan Yin, a Saint, or some other spiritual/religious figure. Wow!!! This is the message that was for you!!! In the difficulty of asking for help from your peers, there is always the Sky that sees beyond and that takes care of us … and in this delightful message your Angel let you ‘see’ that not only he is next to you as your Angel, but also the Sky. Wow!! This evening you may sleep soundly, Love is sweetly tending to you. Roberta experienced this adventure, but the same adventure may happen to you too, each one of you could suddenly, after having asked for help form your Angel and the Sky, find yourselves in front of a number. How to interpret it? On Doreen Virtue’s book there are the meanings of all numbers from 0 to 999, I shall report here the main numbers, allowing you to ‘interpret’ your answer. 0 Angels : God is speaking to you. When you see the number 0, it’s a sign of the circle of Omega, without beginning or end. God is trying to capture your attention with a word of reassurance or of divine guidance. 1 Angels : Remain positive. Everything you are thinking of right now is coming true, so make sure you are only thinking of what you wish for, and not the opposite. Entrust any fear you have to God and to the Angels. 2 Angels : Everything is well and will continue to go well. Continue to believe, your feelings of hope will lead you to further positive outcomes. The Angels can increase your faith if you ask for their help. 3 Angels : The Masters are helping you – usually it’s an ascended master that you feel particularly close to, like Jesus, Quan Yin, a Saint, or some other spiritual/religious figure. 4 Angels : The Angels are with you. The Angels send you the number 4 to reassure you. They heard your prayer and they are helping you. 5 Angels : A significant change is taking place and it will be for the better. It’s always a good idea to ask for help from the Sky whenever there are changes in your life. 6 Angels : Do not worry or obsess over material things, even money. Worries dilute your prayers. Fortunately, Angels can respond to your prayers, if you ask them. 7 Angels : You are on the right road and the outcome will exceed your expectations! The number 7 is a sign that the Divine Magic is supporting you and is offering new opportunities. 9 Angels : Start working, Light Worker … right now! The number 9 means that you completed all prerequisites to fulfill your life purpose. Stop procrastinating because it’s time to begin. Even small steps are useful. 11 Angels : Always maintain a positive attitude! Your thoughts will materialize quickly; so if you want to ensure positive outcomes, only focus on the goodness that is inside you, in others, in the current situation. 33 Angels : You have a strong and clear bond with one or more ascended masters, they have answered your plea and your prayers. Continue to speak to them, since they are helping you with your current situation. 44 Angels : In this precise moment the Angels are offering you their comfort, their love and support. Ask for their help with everything and listen to their guidance through intuition. 55 Angels : This is a period that is “hostile toward old things and in favor of new things”. Open your arms to changes in the measure with which they bring you new happiness. 66 Angels : When you are oppressed by your doubts, by your anxiety or fears, it’s more difficult for you to notice the loving solicitude of your Angels. This is a message to make you dedicate your time to meditation and prayer. Ask for help from the Spirit and open your arms to receive the help that will inevitably follow your prayers. 77 Angels : Keep doing your excellent job! Right now the Midas touch is in everything you do. 88 Angels : Here is a favorable sign for good fortune regarding money. Your action, your prayers, your activities regarding the visualization and fulfillment of your dreams have blossomed into a great flux of abundance. Open your arms and receive it. 99 Angels : The Spiritual world has an urgent message for you: “Do things in favor of your life purpose, right now!” Ask the spiritual world to help you by motivating you, giving you clarity of intent, guidance, and any other thing that you may need. 000 Angels : This is to remind you that you are one with God and that you can feel the presence of the Love of the Creator in front of you. It is also the sign that a cycle has ended. 111 Angels : This number brings you the urgent message that your thoughts are manifesting instantly, therefore keep your mind focused on your desires. Entrust every fear to the Sky so that it can be transmuted. 222 Angels : Have faith that every thing is happening exactly as it should, with the Divine blessings for all those who are involved. Release this situation and have faith. 333 Angels : You are completely surrounded, protected, loved and guided by the benevolent Ascended Masters. 444 Angels : The Angels are here and are everywhere around you! You are completely loved, supported, guided by many Celestial creatures, and you have nothing to fear. 555 Angels : Many changes are about to take place in your life! To maintain these changes within the best possible route, keep your thoughts positive and remain focused on your prayers and affirmations. 666 Angels : Your thoughts are too focused on material things. Elevate your thoughts spiritually to put your life back on the right path. 777 Angels : You are on the right path in every aspect of your life. Remain balanced and spiritually aware, so you may continue to move in this illuminated journey. 888 Angels : This is truly a sign of good omen and complete financial support from the Universe. Money is flowing in your direction. 999 Angels : This message means that an important chapter of your life is about to conclude, and now is the time to start working – without hesitation – on your next chapter. This numerical sequence is like an alarm clock and is ringing loud and clear to push you to work on your life purpose! Here you have it, now your Angels are freer to communicate to you also through numbers, and you are now more aware that you can interpret their messages.